Bats are the only flying mammal. They give birth to live young and feed their offspring with milk produced by the mother. Many bats have a limited home range but some species are highly nomadic and migrate to different roosts depending on mating, food sources and ancestral migration patterns. Bats vary greatly in size and weight, from just a few grams to over a kilogram with wingspans of just centimetres, up to 2 metres. There are two sub orders of bats: mega bats and micro bats. 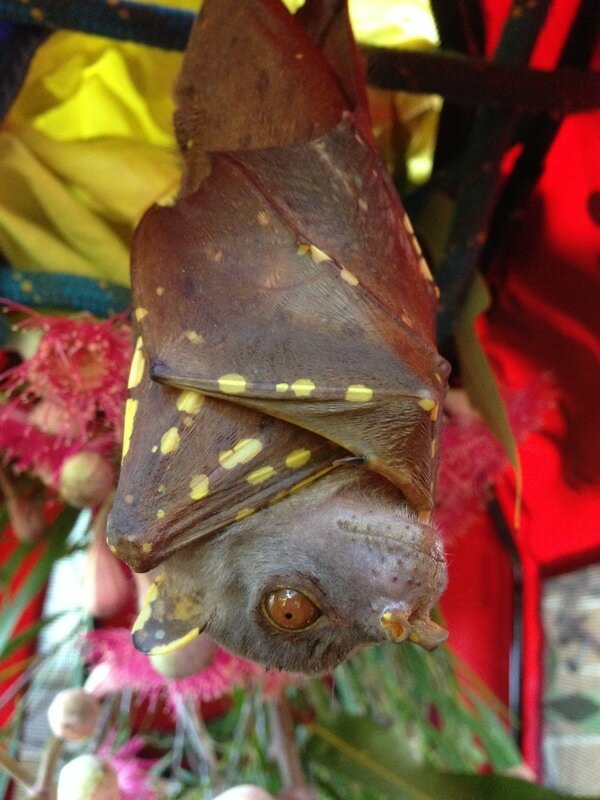 Mega bats follow the bloom of the gum tree and fruiting trees, pollinating and dispersing seeds as they go. We have four species of megabat in the Whitsundays, Mackay and surrounding areas; two being the well known flying foxes; the other two are the Eastern Tubenosed Bat and Blossom bat. Flying foxes can fly up to 70km in one night to forage This is why they are considered to have such an important role in plant diversification. Microbats are great pest controllers for farmers and those who don’t like to be bitten by mosquitoes and sandflies! They mainly eat insects and the Whitsundays is home to about 30 different species. There are over 1000 species of bats in the world, making up over 25% of the world’s species of mammals. Australia has approximately 100 species of bats. Bats drink by licking dew from leaves, skimming their bellies across large water sources during flight and then licking their wet fur, or lapping from smaller pools whilst dangling from overhanging objects. Bats can also swim if they need to. Bats will clean and groom themselves in light rain but then fold and wrap their wings into a raincoat when needed. They are quite particular about their personal hygiene. If a bat is found hanging in a tree or powerline away from the colony during the daylight then we can often assume something is wrong. Sometimes they are just resting and may fly off in the evening. If it does not fly away call FRW on 4947 3389 – we’ll send an experienced rescuer who has been vaccinated for Lyssavirus. Contain the bat if possible – without handling it – and only if safe to do so. If the injured bat is on the ground – cover it with a cloth to prevent further distress or injury and to protect it from the sun. Cover gently with an upside down basket or box. If the injured bat is entangled in barb wire or fruit netting - cover it with a wet towel to reduce stress and prevent further injury. Entangled bats have often suffered blood loss and dehydration and will lick water from the towel. Flying into barb wire: Barb wire entanglements account for the majority of rescues in the Whitsunday area. It poses a huge threat to not only bats, but many other animals. Trauma: Bats sometimes come into care after being hit by a car or flying into a window or building. 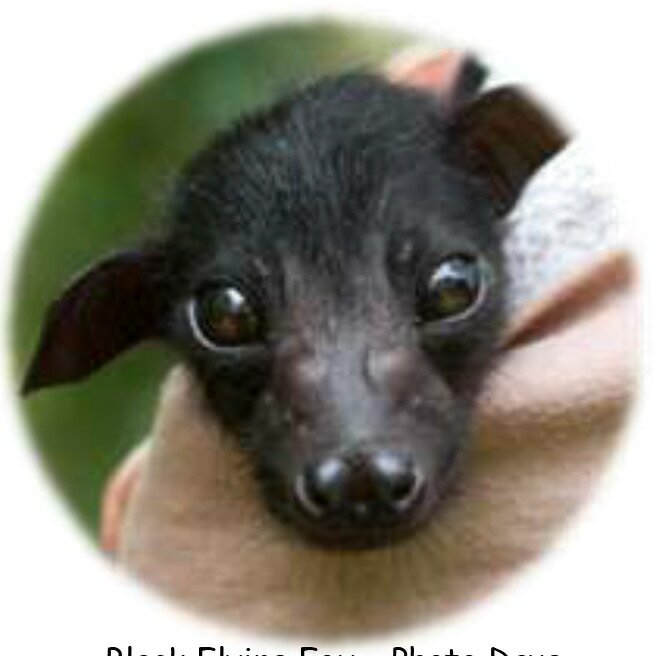 Dog attack: Flying foxes are prone to being attacked by domestic dogs, as they sometimes feed on low vegetation. If bitten they require urgent veterinary attention. Getting tangled in fruit netting: This usually occurs when the fruit netting has been installed incorrectly. Please see our website or call us for more information on how to correctly install fruit netting. Extreme weather conditions: Extreme heat waves or cold often result in the death of thousands of these sensitive animals in flying fox camps. Bats are often disorientated or displaced after severe storms. Tick paralysis: Bats suffer from the paralysis tick in the same way that many domestic animals do. They have a better chance of survival if rescued early. Poisoning from palm berries: Flying foxes feed on the berries of the cocos palm. The fruit can be toxic to the bats if eaten when not fully ripe. Injuries from power lines: Flying foxes can be electrocuted from incorrectly landing on power lines. Never attempt to free the animal yourself. Old age and frailty: As they age, their teeth wear down and they are unable to eat adequately. This makes them weak and malnourished. Orphaned babies: During breeding season, baby bats come into care for many reasons, including their mother suffering any of the above misadventures, or sometimes from falling off mum while she is in flight. Lyssavirus, for practical purposes, should be treated as rabies. The human risk, although minimal should be taken very seriously. All direct contact with bats should be avoided unless the handler has been vaccinated for Lyssavirus. Australian Bat Lyssavirus is rare in bats, but any bat may carry the virus. ABLV can be fatal but immediate medical intervention to receive post-exposure vaccination can prevent the onset of the disease. 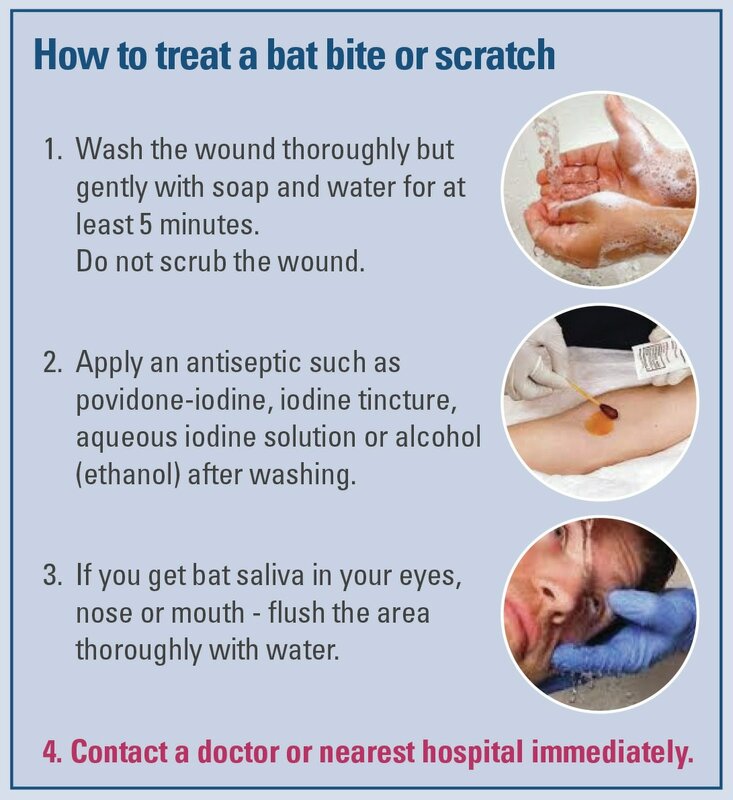 To catch ABLV from an infected bat you need to have contact with bat saliva onto broken skin or the mucous membranes of the eyes, nose or mouth. This commonly occurs through a bite or scratch.